Russian mid-sized oil company Bashneft is currently holding talks on the possible sale of a 20-25% stake to India's state-run Oil and Natural Gas Corporation Limited. Russia’s Bashneft is considering the possibility of the entry of India’s Oil and Natural Gas Corp into its joint-stock capital with a share of 20-25%, according to Alexander Goncharuk, chairman of the Russian oil concern’s board of directors. “We are considering the entry of ONGC as one of the variants for the development of Bashneft, as a means of attracting additional funds. If ONGC enters the capital of our company, then it will be present in all our projects,” added Goncharuk. Moreover, Goncharuk said that Bashneft is considering Lukoil as a partner in developing the giant Arctic Trebs and Titov oil fields. “We are in talks with Lukoil, as we have already said on a number of occasions,” he stressed. The return from these oil fields, which were recently acquired by Bashneft, will be received in 2015-2016. “By that time we should have raised our output to 18-20 million tons,” said Goncharuk. He noted that Bashneft plans to achieve this volume by increasing its own output, as well as by acquiring new assets. At the same time, Goncharuk would not say if Bashneft was interested in acquiring Tatneft in the Nenets Autonomous Okrug. Tatneft was recently put up for sale. Goncharuk said only that it was a “question of the price”. He added that in choosing new sites for drilling, Bashneft was primarily guided by convenience of location and logistics. Earlier the sides planned to found a joint enterprise (JE). These intentions were spelled out in writing at the end of last year. The Russian holding company Sistema could contribute as assets to the JE a block of shares in Bashneft and 49% of shares in RussNeft. Meanwhile, ONGC Videsh could contribute 100% of shares in the Imperial Energy Corp, which owns oil fields in Russia. Many experts agree that the companies may have to create a JE in order to jointly develop the Trebs and Titov oil fields, the right to which was recently won by Bashneft. 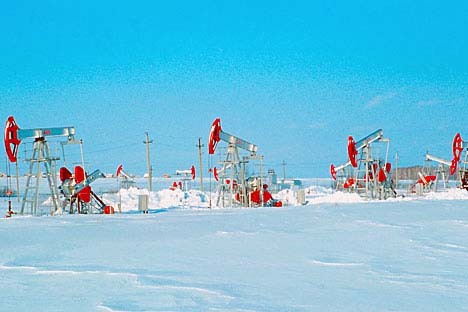 The Trebs and Titov oil fields are located in the Nenets Autonomous Okrug. According to the Federal Agency for Mineral Use, the Trebs oil field has reserves totaling 89,727 million tons in the С1 category, 50,332 million tons in the C2 category, and 59,289 million tons in the С3 category. The reserves in the Titov oil fields in C1 and C2 categories totals reportedly total 57,59 million tons.